At the Daily Planet, a man walks into the bullpen rambling about reporters printing fake news. Carrying a pistol, he reveals a bomb strapped to his chest. Meanwhile, Superman and Jor-El continue to talk in the Fortress. The Man of Steel refuses to leave Earth, despite Jor-El insisting that all humans are wicked. To prove his point, Jor-El has Kelex pull up newsfeed videos of atrocities happening all over the globe (many of which Jor influenced, by the way). Kal flies off to stop chemical weapons from being used in Logamba. Back in Metropolis, Lois tries to reason with the terrorist. Steve Lombard tries to save the day, but gets shot in the chest. To keep Jon, Perry, Jimmy, and the other Planet staffers safe, Lois strikes a deal with the terrorist: she'll write a story from his perspective verbatim and publish it on the Planet's website, but only if he lets the others leave. A deal is made, but Lois has a trick up her sleeve. With access to a keyboard, she can send a message to the Fortress to let Clark know there's trouble. Over in Logamba, the country's leaders prepare to launch a full-on chemical assault on the country's own citizens. As the chemical missiles are fired, Superman arrives and destroys the launchers. With great speed, the Man of Steel flies after the missiles to disarm and destroy them. Lois has finished typing the story, but hasn't had a chance to send a distress signal with her captor looking over her shoulder. Momentarily distracted, the man looks out the window, allowing Lois to call for help. Suddenly, the terrorist is taken out by a speeding blur. Jor-El now stands in the office of the Daily Planet. Down on the street, Jon sneaks away from "Uncle" Perry and makes a quick change into Superboy. Across the globe, Superman has successfully rendered the chemical containers useless and destroyed the remaining missiles. Jor-El and Lois briefly talk before the staff of the Daily Planet return. 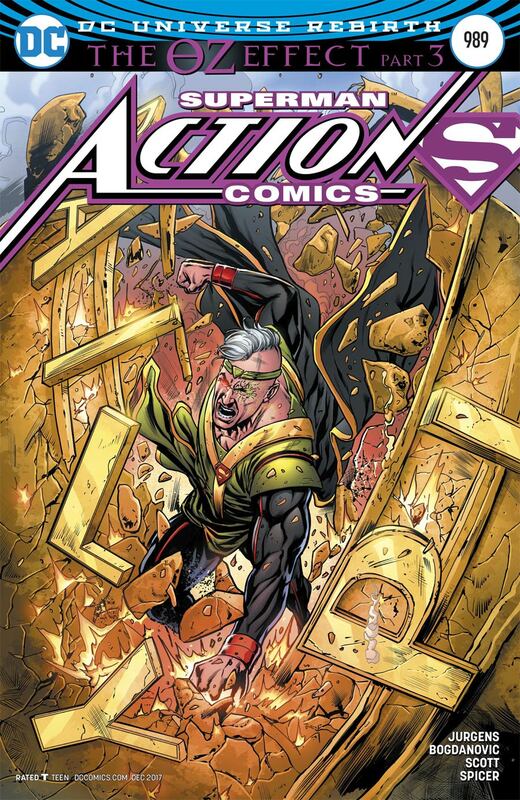 Jor-El leaves, only to confront Superboy moments later. The two teleport to the Fortress where Jor strives to win Jon over by promising him a world where he wouldn't have to hide his true self. Jor-El has plans to take him to a new world. Story - 3: I'm still having a hard time buying that Oz is Jor-El. Too much doesn't add up. I mean no disrespect to Mr. Jurgens, by the way. I think that this skepticism towards the Oz reveal is what Jurgens was aiming to elicit. There's just something too convenient about his story, and while we know that there are forces present in the DCU now to make his story a real possibility, I can't help wondering what Lois is wondering: why reveal himself now? Why wait so long to reveal yourself to your son? There's something fishy about the whole thing, and knowing Jurgens, I suspect there's something bigger planned. Jurgens isn't the sort of writer that writes shocking reveals for the fun of it; there's always something bigger right around the corner with his stories. And with Doomsday Clock coming next month, there's bound to be another player in all of this. At my local comic shop, our suspicion is Superboy Prime is behind some of this. Regarding the issue itself, there's quite a bit of talking. I don't necessarily mind wordy books, but the Fortress discussion between Superman and Jor-El has been present in all three parts of this story. Fortunately, it ends rather quickly. Nevertheless, not much seems to happen in this book. There are some small teases with Jon's future and we see Jor-El try to weasel his way into Lois and Jon's good side, but not much happens outside of that. Regardless, I'm interested in seeing what happens next issue. Art - 4: Much better. This is the Bogdanovic art that I like to see. Drawings are clearer, less sketchy, and dynamic. There are some absolutely stunning pieces of art with Superman in action. The whole scene with the missiles is very reminiscent of the missile chase scene in Superman: The Movie. Regarding the art on The Oz Effect as a whole, I wish that the art was only done by one artist, just for consistency sake. Then again, these books are released bi-weekly, so I can understand the necessity for alternating art duties. Cover Art - 5: Now this is a cover! As much as I appreciate the talent and work put toward the covers of the Superman books, we haven't had many that look instantly iconic in a while. There are some very good modern covers, but after a while, a lot of them just start to look the same. This isn't a slam against the artists at all, but they certainly don't compare to the covers of the past. With this cover, I'm both hooked and amazed by the artist's talent. The cover reminds me a lot of those gorgeous Adam Kubert covers of the late 2000s - particularly the covers for Last Son. The lenticular feature also works well with this cover. The art isn't too detailed that the beauty of the piece is lost on the gimmick. With the past few lenticular covers, it's been a bit hard to appreciate the art, but here, the gimmick works wonderfully. I'd love to have the Superman image as a poster. 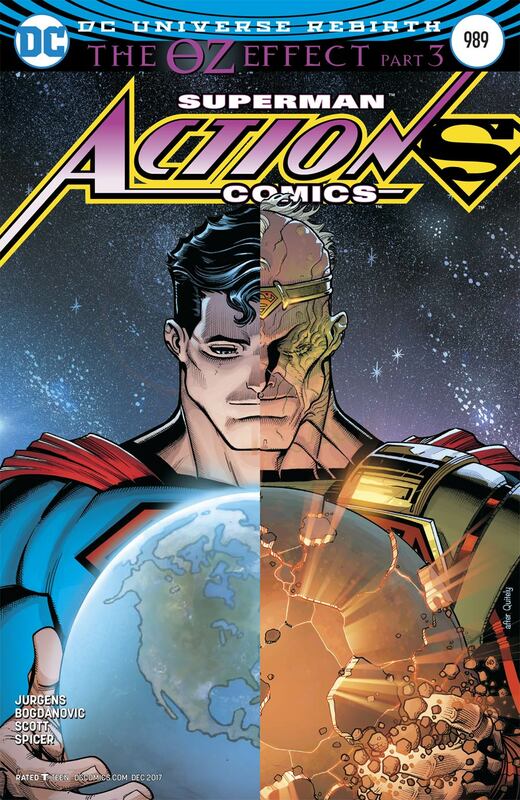 Variant Cover Art - 3: This cover is well drawn, but the bar's been set very high by the standard cover.